Sadly i missed out on the Christmas & new year decorations/smiley and i doubt i will ever have the fan boy smiley as i am not sending a post card. Only others are wizard which is all down to luck and the big spender, but that's only if i ever earn enough free gems. Currently i'm halfway to getting the great saved world. I got GREAT saved world. Things that i have: 231x max energy, all smileys (excepting terminator, spender and fan), all bricks (excepting CHRIStmas package and Secret Passage package), 20x coin doors, 5x spawn points. Things that i going to get: Fan smiley, terminator smiley and chat. I bought a Massieve world! 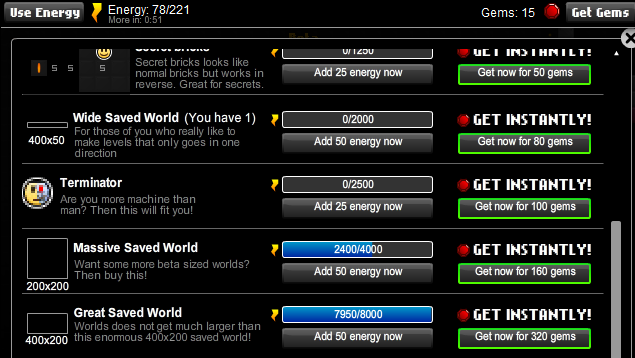 i have now 44 energy and on Great World i have 7950/8000 energy! o_O crazy! today i get great world! AWESOME I got a great world yesterday morning and I just found out I have the fanboy smiley about 2 minutes ago! So far, I have: Ninja, Santa, =. guy, worker, mustache man, small world, large world, massive world, factory pack, fully black blocks, 3 spawn points, and coin doors. There will soon be more! FINALLY after over a week of boringly shoving my energy into a Great Saved World, I have it! Yep I got that sweet smellin' flower! I'VE JUST GOT AN MAGICAL COIN!! I thought it was mine! hehehehe! I got the ninja smiley! I got Adobe Photoshop CS3 Extended woot. I got a great world. And I'm making a huge factory.